One of the undisputed achievements of the Kurdish movement in Turkey and Syria is the advancement of women in social, economic, and political domains of life. The theoretical underpinning of the movement’s efforts to achieve gender equality lies in the concept of jineology elaborated by the movement’s leader Abdullah Ocalan. Placing the liberation of women at the center of his theory, Ocalan identified monotheistic religions, the nation-state, and capitalism as three roots of women’s oppression and traced the emergence of gender hierarchies as far back as the Neolithic era. Together with the focus on ecology and direct democracy, women’s empowerment is one of the pillars of democratic autonomy and confederalism – Ocalan’s vision of a non-oppressive society, pursued by the movement both in Turkish (Bakur) and Syrian (Rojava) Kurdish regions. Putting this theory in practice, the Kurdish movement has set up 40% women’s quotas in their organizations, created women-only organizations parallel to mixed-gender ones, as well as women’s neighbourhood assemblies, academies and cooperatives, and introduced a co-leadership system with one woman and one man at the head of any administrative body, including in municipalities under the control of pro-Kurdish parties. We took the rare opportunity to talk to an editor of the Jineoloji Journal in Diyarbakir about theoretical and practical activities of the Kurdish women’s movement in Turkey. The journal is one of the few remaining initiatives by the Kurdish movement that have not been shut down in the wake of the 2015-2016 military offensive by the Turkish state on predominantly Kurdish cities or otherwise repressed since the 2016 failed coup attempt. 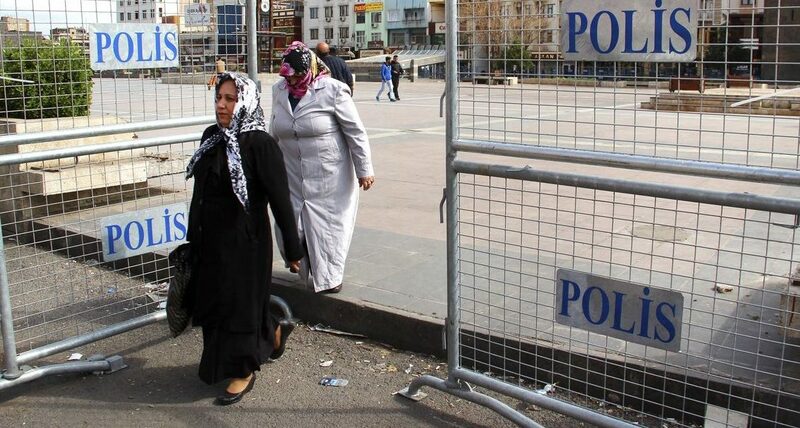 The latter was followed by massive repressions and the imposition of Ankara-appointed trustees in charge of Kurdish-majority municipalities (kayyum). Anya Briy (AB): Tell us about your journal. Editor (B.E. ): Jineoloji has been published since 2016. We see it as a free theoretical, scientific and political journal, open for all of the women around the world. In each of our issues we try to handle one of the questions that is important for the concept of jineoloji and for the women’s agenda at a specific moment in time, as well as broader historical and sociological questions. It is important to think about women and life in all of its aspects. We are against the opinion that “the women’s question” is just related to “women’s problems.” Everything that happens is related to women. We deal with issues ranging from ecology to science and to the arts. We can say that our journal is still a baby. We feel that it is growing and becoming known by more and more women; our ties of sharing go deeper and deeper. While we are publishing in Turkish, we also have articles in many languages published on our website – from English to Spanish, Kurdish, and Arabic. AB: Tell us more about the concept of jineoloji. B.E. : The concept is new: for the first time, this concept was introduced in Ocalan’s book Freedom of Sociology [correct title: Sociology of Freedom] in 2008. But the philosophy behind it is not. Ocalan offered jineoloji as the science of women and life. Since nowadays there are sciences of almost everything, he asked why science had not focused on women as an important topic for investigation? He thought that we should develop women’s science and treat women not just as sexual beings but as the main subject of history, viewing them as an object of sociology from various perspectives – from the psychological to the economic. At the same time, we should not view women as isolated beings. They are the base of the society and life: socialization begins with women. Hence, to understand society’s reality and to transform it, to implant revolutionary ideas, we need first to understand women. After 2008, some women started thinking about this concept, how to combine it with former women’s struggles, ideas and theories developed by previous women’s movements. Today, we have a jineoloji department at the university in Rojava, our journal here in Turkey, and many other academic initiatives. AB: What made the Kurdish movement focus on women? How, historically, has this become the central question for the Kurdish struggle? B.E. : We often say that we follow this proverb: you should look for what you lost in the place where you have lost it. The Kurdish movement’s general paradigm has been built on the concept of an ethical political society, with references to the communal society of the pre-neolithic and part of the neolithic era. The whole of history can be systematized in two concepts: capitalist modernityand democratic modernity. The roots of the latter come from ethical political – or natural – society. When we look at our region, Mesopotamia, or the Middle East, we can clearly see a continuous process of women being pushed back in terms of their position in the society. Even during my lifetime, for the last 50-60 years, I was able to observe a change in women’s conditions and their status in villages – regression and ongoing subordination. At the same time we can see that women are strong: when we go to the villages not yet fully affected by capitalism, we find social relations that are more communal, with a higher status for women. Visit local communities in which a monotheistic religion is not dominant, and you can also see a difference in women’s position in the society. These are clues that show us how to analyze women’s status comparatively. If you analyze the historical process of how state, capital, and religion went hand in hand with a patriarchal mentality, you will realize that this process is not normal, that it has relied on power and violence. When you disrupt, destroy the very essence and meaning of life itself – which is the mentality that guides one’s treatment of nature and other human beings in this society – then everything is disrupted and destroyed. That’s why, if we can rectify our relationship with women and change people’s minds in this regard, this will have an impact on everything else in life. AB: You mention places in the Kurdish region where communal relations have been preserved. How has that been changing given the increased urbanization of the rural Kurdish population in recent decades? B.E. : Unfortunately I cannot urge you to go and see this with your own eyes because there is a war going on there that is destroying not only people, but the region itself with all it contains that is living. You may have heard that in some regions of Turkey, like Botan, Sirnak, Hakkari, Mardin, or some districts of Wan, there are still people – most of them women – who cure illnesses with natural remedies, or traditional medicine as it is called by modern science. There are people who do not use money but rather exchange their goods or help each other with their needs. Societies that are not in a close relationship with capitalism or with cities are different in many ways. In cities you soon see all those cultural and societal features erode. Yet, even in cities in Turkey, if there is some green space around high-rise buildings, you can often see women cooking something under the trees. For example, there is a season in summer for preparing traditional baba ganoush made out of eggplant. Women often find a place on a sidewalk, near luxury buildings, to cook in order to preserve food for winter instead of buying it at a market. These are positive signs. On the other hand, you cannot avoid seeing the pressure that women are under in the Middle East, including in Kurdistan. Many women are being harassed and even killed. Why? This is a war. When you look deeper, you see women’s struggle in daily life, the long history of their pain. In the Middle East especially, you will find only a few women talking openly about politics, science or literature. But women have been dealing with science, literature and arts; women have contributed to the creation of the foundation of modern technology, science and medicine. So why does the patriarchy, the capitalist male state, insist on shutting down women’s voices and throwing a thick blanket over their contributions? We say that we should make what is unknowable knowable. We should dig and find women’s voices and creations. We should do this in our region. There are, of course, many other women’s organizations and political theories that also engage with the same issues that we do. But it is not enough for us just to take other women’s words as if they are ours. We say that every woman should know, learn, and reveal her own history and herself as a sociological being in her own region. That’s why the Kurdish women’s movement tries to develop jineoloji as the science of women and life. AB: The Kurdish women’s movement developes some theory and practices unique for your own region. What differences do you see between your perspective and those of western feminism(s)? B.E. : We have read western feminists’ writings: we know and appreciate their arguments because they have made many questions clear for all women. Yet, it is not enough for us. We should do something different because we are in a crisis, as are all women around the world, in my opinion.We say that every woman should know, learn, and reveal her own history and herself as a sociological being in her own region. There is an enormous amount of literature on the women’s question in all of its aspects – from sexuality to ecology – but the problems confronting women because they are women seem only to be growing. So we should stop and think what is missing. This is the main dilemma for us as we deal with other women’s movements. When we propose to use a different paradigm, to think from a different perspective, western feminists feel as if we reject feminism and replace it with jineoloji. This is not the case. We have strong criticisms. For example, just like black feminists, we have criticized white feminism for taking only one – middle class white perspective and trying to solve all the problems around the world with the same method. But this cannot work. One theory cannot handle all the issues. For example, queer theory may work very well in Europe but it is not sufficient for us to explain what society is facing in Kurdistan. So we need to develop our own theory, but there is no hierarchical relationship between our knowledges. We should talk and think together how to solve this crisis we are all in. At the same time, when we look deeper into our problems, we can see that – whether we talk about European or Latin American women – they are all rooted in the hierarchical power relationship that has been institutionalized by the state, capitalism and religion. We can categorize our main criticism of mainstream western feminism as follows: orientalism, a positivist mentality, and the fact it does not aim to change the whole system – the patriarchal system. It only advocates for a change within the system. We believe that the system itself is the reason for all the problems – we cannot develop our ideas of resistance within it. AB: Could you say more about your critique of western positivism? B.E. : Mainstream western feminism emerged after the Enlightenment era. According to our interpretation, they relied on ideas developed during that period, including those of science. Reliance on science is considered to be a good thing. This idea affects the mainstream western women’s movements as well as social movements in general that claim to be scientific. They reject the concept of soul and underestimate the emotional aspect of life, mainly relying on things that can be touched and verified, believing that we can obtain knowledge through experience. Social theories of that era were also affected by this understanding. Let me give you one example. When we say that there is communal life in Kurdistan and women have more power and can be more creative here because the rules of this society come from what we call “natural society,” we are immediately interrogated for proofs and references. If you do not criticize the problematic nature of the very foundation of your social theory, you cannot completely emancipate yourself and your ideas. Scientific theories themselves are shaped by the male perspective. Francis Bacon, for example (whom we often cite when we make this criticism), is the founder of positivist thinking. He is one of the main figures of the Enlightenment, and he was also a “killer” of women—”witches”— of that time. But we need to reconsider, for example, how witch hunting impacted on the evolution of scientific theories. When we look at the first movements of western feminism, we see the first precious steps towards emancipation, such as gaining voting rights, etc. As yet, however, there is no criticism of the system as a whole. AB: How strong is the patriarchal mentality in the region? How successful has the movement been in changing this mentality? B.E. : It is very hard to change the patriarchal mentality of men and society as a whole – but not impossible. We always say that ‘man’ is in power. In this system, nobody will easily give up the power contained in his – or sometimes her hands – so we should push those who are in power to change. The stronger the women’s movement is, the easier it is to force men to change. If the women’s movement becomes weaker, the male mentality intensifies again. This is what we have seen in Kurdistan. This shows how the state and patriarchy cooperate and how the male mentality is on the look-out for a chance to exercise its power against women. There is no way to change men except by changing women’s mentality first and making women’s organizations stronger and stronger. If we are strong and can make institutional changes in our lives, then men start to think about themselves. So our male comrades in political organizations feel themselves a little bit obliged to behave in a more democratic, equal way. But this does not always mean that they really change. Changing minds takes more time than changing behavior. A man can change his behaviour while he is dealing with politics, but he can behave very differently outside organizational life. We have seen many examples of this. We should also remember another important factor. There have been strong female characters in Kurdish history – women-warriors. After the last guerilla warfare started [by the PKK], with female guerillas leaving their families and villages and going to places that are called “free places” to fight against the state and to confront those in power, women in the society started feeling more confident. Every woman does not choose to go to fight, of course, but those who stay in their villages or cities see and hear about the women-fighters who leave their families and everything that they are forced by their families to do. Those who stay feel stronger and more motivated. And those women who choose to fight, they also fight against patriarchal mentalities, besides other things. Women are still struggling in this fight but we should remember that Ocalan, the leader of the guerilla movement, is a very important figure for women and, as the leader of women, he has been struggling for women’s rights and freedom within the movement itself and within the society. If you go to an ordinary house and ask the older women and grandmothers what they think about Ocalan, they will very likely say, “God bless him, he has saved us.” They feel this confidence – at least the part of the society that has been affected by the movement’s discourse. But a change in one part of the society will affect the entire society. In the Kurdish situation, we can say, more or less, that everyone knows there are women and there is the women’s movement which one should not confront. And women know that they are not alone, and that it is not their destiny to live in subordination.Women know that they are not alone, and that it is not their destiny to live in subordination. AB: Give us a concrete example of how, before the imposition of kayyum, women’s organizations were dealing with various issues, for example, domestic violence? B.E. : At that time, women’s organizations were not just working inside an office waiting for women to register their complaints. Instead, they would do social work, they would organize themselves as women’s assemblies in districts. Almost everyone in a district would know people who worked in women’s institutions or know their location, so anyone could call and say, “I’m in danger, please come help me.” Alternatively, family members and neighbours could call and report domestic violence, or go to these institutions and explain the situation. This was critical: a direct contact between women’s institutions and women living in respective neighbourhoods. These were not official state institutions. They occupied a place between the state and society. Given our history, for example, people here do not feel comfortable going to police stations. Institutions within the Kurdish movement itself were trying to establish a closer contact with women. Social work in neighbourhoods was their main method. With the kayyum, these institutions were not closed right away. The trustees first forced the women to end their social work in the neighbourhoods. They ordered them to stay inside their institutions and only deal with women who would come to them themselves. Eventually, they closed most of these institutions. Now we do not know where to direct women who face problems of violence; there is almost nowhere for us to go. These are hard times for women who are faced with violence as well as the consequences of the state of emergency — women cannot make their statements openly, for example, through demonstrations on the street, or in other forms of self-expression. Children are probably the most fragile nowadays. For example, the BARO lawyers’ association of Amed, where they have a women’s center, say that over the last year, there has been an increase of the instances of sexual harassment within families. Numbers are going higher and higher. Children and teenageers themselves go to the BARO and register for a legal process. But the BARO cannot do anything for them, besides taking the claims. These children have to go back to their home, to their life; there are less and less mechanisms that we can use to help them. We cannot easily open new institutions: the minute you open these, the state closes them down. So it is a frustrating process for everybody. But the solution is as always – struggle, struggle, struggle. There is no other way.